Whoever wins in 2015 will face awful public spending choices. The woeful state of the economy means the deficit will remain high and there will be almost no scope for public spending growth. So George Osborne smells blood. He is quietly plotting a public spending review in 2013 to set out plans for spending after 2015. He hopes he will force Labour into rejecting his plans without an alternative – and losing any hope of fiscal credibility in the process. But where do people think the money goes now? And what are their priorities for spending in the future? New Fabian polling, conducted by YouGov, finds some truly surprising answers, with a mix of good and bad news for the left. After two years of the government’s austerity narrative, ‘core’ areas of public spending still receive very strong backing. But less mainstream services which matter hugely to the left are little valued by the public, with one important exception. 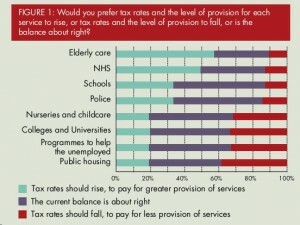 FIGURE 1: Would you prefer tax rates and the level of provision for each service to rise, or tax rates and the level of provision to fall, or is the balance about right? 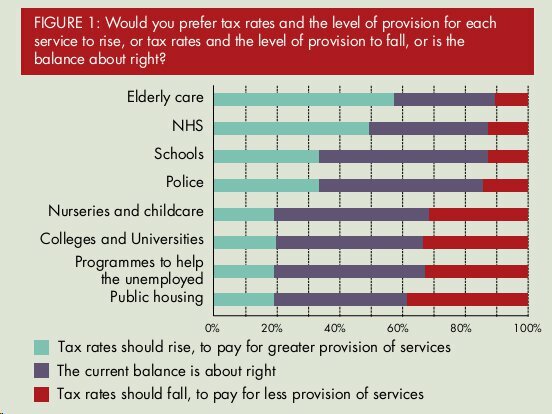 Our first conclusion is that the British are conservative, with a small-c. For six of the eight areas of spending the most popular option is ‘the current balance is about right’ – around half support this view with respect to police, jobs programmes, early years, schools, colleges and universities. In two fields, however, more people wanted a spending rise than a stand-still. These were the NHS and, perhaps more surprisingly, elderly care. Indeed older people’s social care was the only one of our eight areas where a majority (57 per cent) of those expressing an opinion wanted more spending. The news that eldercare is the public’s top priority for any extra spending should provide a real boost for advocates for comprehensive reform of England’s disastrous social care system. But the rest of the results make for grim reading for Labour politicians. In four areas which are top priorities for the party, many more people support spending cuts than increases – across early years, colleges and universities, and job programmes, for every two people who supported spending rises, three supported cuts. When it comes to subsidised housing, a top priority for many on the left, the results were even worse: twice as many people want cuts as increases. None of this is to say Labour should abandon its ambitions for investment in these areas. But it does suggest a great deal of thought and effort will be needed to successfully make the case for investment. By contrast the findings on social care are very positive. They suggest the public will get behind politicians if they finally agree a cross-party solution, even if it requires people to pay for it. These general patterns have their variations, although none undermine the overall picture. 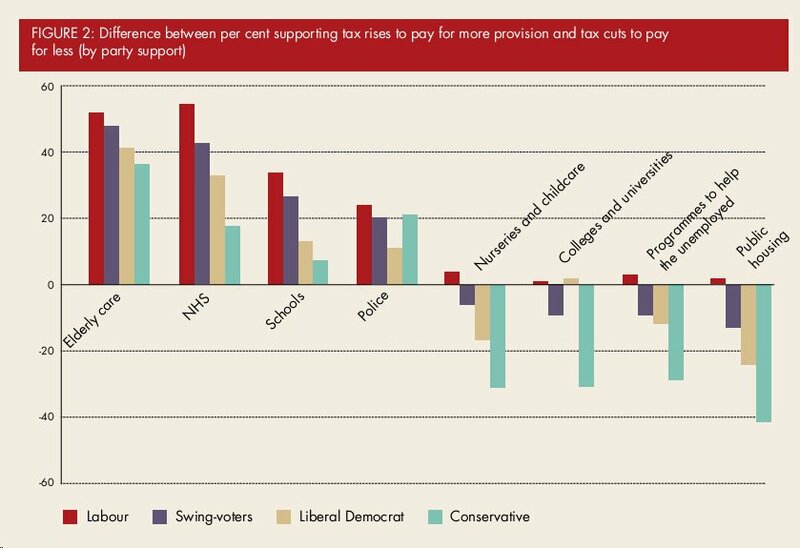 Not surprisingly Labour voters are a lot more positive about increasing spending on public services than Conservatives, or even Liberal Democrats. Interestingly ‘swing-voters’ – people who didn’t vote Labour in 2010 but are now considering it – are closer to the Labour position on most areas. Party political identification makes the least difference when it comes to views on policing, followed by social care. Investment in public housing is the most divisive area, but even among Labour supporters, as many want spending cuts as want rises. Looking at different demographic groups, women are more positive about spending increases across the board, but particularly with respect to the NHS, elderly care and policing. Meanwhile lower income groups (C2DEs) are noticeably more positive than ABC1s about spending on NHS, public housing and (to a lesser extent) early years and jobs programmes. By contrast they are less supportive of extra school spending. It is hardly a revelation, but this reminds us that championing the NHS remains a huge ‘pull’ for Labour-leaning demographics, including women and lower income families. Age is an important factor, but not as determinative as one might imagine, with only limited evidence of different generations expressing ‘selfish’ preferences. For example we were extremely surprised to discover that almost as many 18 to 24 year-olds support a cut in spending on colleges and universities as back an increase. 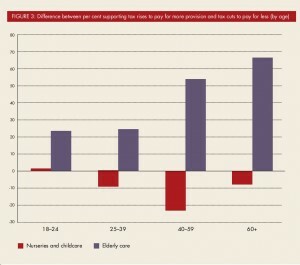 Elderly care was much more popular than early years across all age-groups, although that support increases with age. 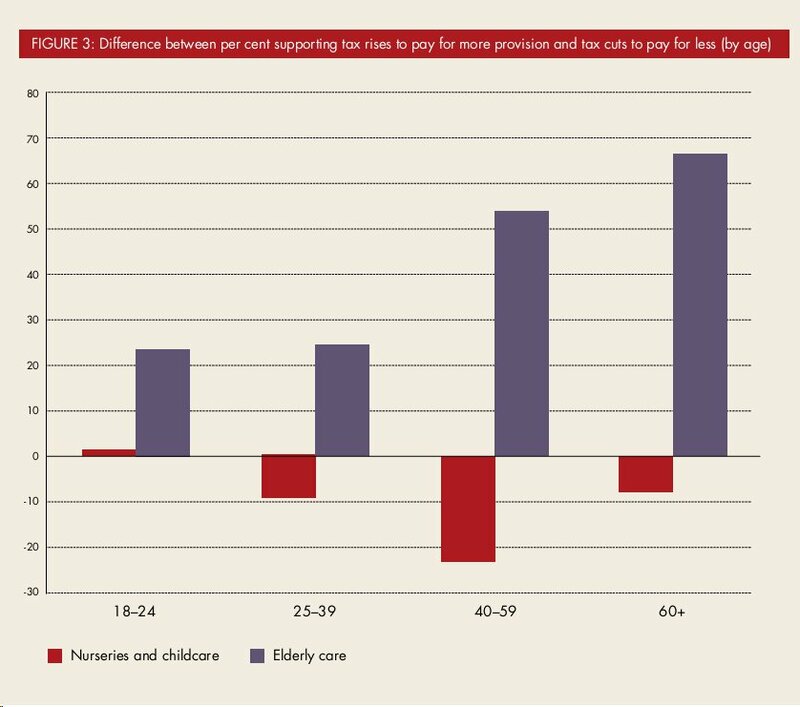 Meanwhile more people opposed than supported spending on early years among each age-group except the under-24s, with the most hostile cohort aged 40 to 59. In six out of eight areas no age-group was more pro-spending than the over 60s, despite their strong Conservative leaning. This underlies the importance for Labour of talking about the risks the coalition is taking with public services. Eleven years ago the Fabian Commission on Taxation and Citizenship proposed the publication of citizens’ tax statements setting out how the public’s money is spent. Somewhat to our surprise, the idea has resurfaced as a key part of George Osborne’s proposals to exert downward pressure on public spending. Many on the left are wary. But our new research suggests that greater transparency could actually give reassurance to the public when it comes to ‘unpopular’ areas of public spending. Why? 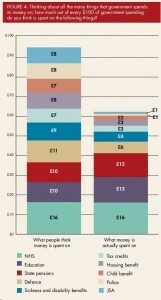 Because people think we spend far more on them than we do. The first important finding is that people usually over estimate how much money is spent. This was true for eight of the ten areas we asked people about. Based on the average response to each question, people thought that the ten areas together accounted for 91 per cent of all public spending, when the actual figure is 61 per cent. This inaccuracy is not evenly distributed however: people are far better at guessing how much we spend on ‘big’ areas of spending – the NHS, state pensions and education – than the rest. Indeed the average response for the NHS was correct (16 pence in the pound). By contrast the smallest budget we asked about, job seeker’s allowance, produced the greatest inaccuracy, with the average response more than ten times higher than the true response (7.7 per cent rather than 0.7 per cent). 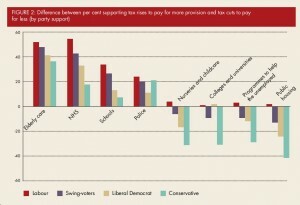 The data also hints that people may be particularly inclined to over-estimate the scale of unpopular areas of spending: in reality we spend roughly the same on tax credits, disability benefits and housing benefit; but the scale of over-estimate was higher for the latter two which are much tend to attract much more negative comment. Our conclusion is that the left has little to fear from better information on how much is spent, as long as the information is presented in an open, clear way. If anything, citizens’ statements may convince people we spend less on ‘unpopular’ causes than they think. 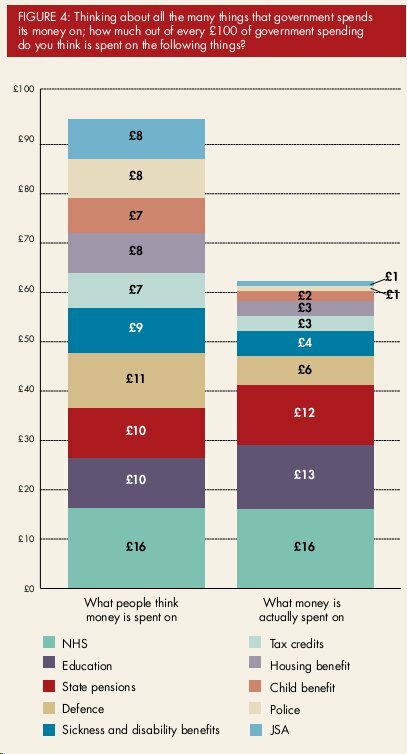 FIGURE 4: Thinking about all the many things that government spends its money on; how much out of every £100 of government spending do you think is spent on the following things? The results are from a YouGov / Fabian Society poll with a total sample size was 2,050 adults. Fieldwork was undertaken between 4th – 11th April 2012. The survey was carried out online. The figures have been weighted and are representative of all GB adults (aged 18+).